Lesley Fox is the executive director of the Association for the Protection of Fur-Bearing Animals, a nonprofit animal-protection organization based in Burnaby, British Columbia, Canada. Right now, off the east coast of Canada, the largest marine mammal slaughter in the world is taking place and the images are very disturbing. It's not my intention to be sensationalist, but it is a fact that when you kill hundreds of thousands of baby seals, the water and ice off the east coast of Canada turns red from all of the blood. Making this year even more shocking than before, the Tories' killing quota is the highest it has ever been—over 468,200 harp, grey and hooded seals are on the chopping block. Literally. In a world when we marvel in the advances of computer science, medical wonders, and scientific discoveries, there is something seriously wrong with grown men wielding clubs and hooks to bash in the brains of baby seals. Reports indicate that approximately 95 percent of seals killed are between the ages of two weeks to three months old. While the killing of the fluffy newborn whitecoat seals is prohibited, once they have begun to molt their pelts (usually around 12 days of age) they are fair game. It's easy for sealers to target the babies because these young animals are reluctant to leave the ice, and are not yet strong swimmers. But despite public outcry and general common sense, the seal slaughter has been going on for decades and with lots of support from the government. Why is Canada killing seals? That's a good question. The Department of Fisheries and Oceans says, "As a time-honoured tradition, Canada's seal harvest supports many coastal families who can derive as much as 35% of their annual income from this practice." But opponents point out that the hunt is cruel and unsustainable, and the sealers, who are essentially commercial fishermen, earn on average less than five percent of their income from killing seals. Then there is also the question of political motives. It's no secret that there is much competition between political parties for votes in the rural areas of Newfoundland, and any party that opposes the seal hunt can consider themselves out of the running. While no one really knows exactly why Canada loves killing baby seals, a few things are certain. The math doesn't add up. Furthermore, the primary objective of the Department of Fisheries and Oceans is to ensure there is a boomingfishing industry. But fish populations have been dwindling for years and rather than admit to over-fishing or mismanagement playing any part, it is a lot easier for them to just blame the seals for eating all the fish. Imagine the advantage you would have as a business owner if you could literally kill your main competitor. 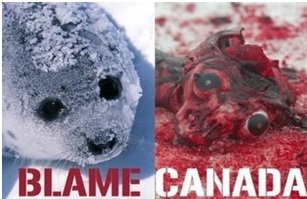 While no one really knows exactly why Canada loves killing baby seals, a few things are certain. Last year, it was reported that the Canadian seal hunt generated $1.4 million, but taxpayers paid $4.3 million for the Canadian Coast Guard to monitor the area. And while the government no longer makes direct contributions to the seal hunt, funding is still available for ice breaking vessels and tax breaks seem to be doled out to any sealer who wants one. It's not only Canadians that are rethinking the seal slaughter; it's entire countries too. For example, according to the International Fund for Animal Welfare, the government of Newfoundland and Labrador is working to ensure a retroactive tax exemption for sealers who have not been paying the harmonized sales tax on pelts they have sold. Over the past three years alone, this could amount to a $6.3-million "tax break" for the sealing industry. In addition to all of this funding, the Canadian government continues to subsidize research into developing new markets for seal products and is currently spending your money promoting and marketing seal products overseas. This is a lot of money to waste on something that the majority of Canadians don't even want. And it's not only Canadians that are rethinking the seal slaughter; it's entire countries too. Since 1972, the United States has closed its border to Canada's seal pelts, and just recently the 27-nation European Union followed suit. Currently, China is our main dumping ground for seal skins, but even that agreement is on thin ice. Speaking of thin ice, the dwindling market for seal pelts isn't the only problem facing the seal industry. Mother nature is proving to be an obstacle too. Global warming is melting the ice that the seals rely on to give birth and to nurse their pups. Scientists who work for the Department of Fisheries have recently voiced their concern about the seals' mortality rate, saying it could be far higher than normal because females don't have enough ice to give birth to their pups. Scientists are also reporting that the ice is breaking up faster than normal, and as a result, many seal pups are drowning because they are too young to survive in the open water. So considering the global market for seal products is diminishing, and seal populations are in jeopardy because of global warming, the time is right to turn our attention to creating real solutions for the sealers and the animals. Some suggestions include a one-time buyout of the commercial sealing industry where fishermen would be compensated for lost income, and funds could be invested into job retraining or alternative industries. This isn't a bad idea considering it worked for the whaling industry. In 1972, the Canadian government ended commercial whaling, and licence holders were compensated. Today, the whaling industry has completely reinvented itself with eco-tours and whale watching, which are proving to be a profitable attraction, particularly for tourists. Whether you are opposed to the inherent cruelty of the seal hunt or the waste of taxpayer money, or it's the impact of global warming on seal populations that concerns you, the time to act is now. During this election, each one of us has an opportunity to voice our opposition over the seal hunt to our member of Parliament. Collectively, we have the power to end this slaughter for once and for all—and we can do that at the polls.